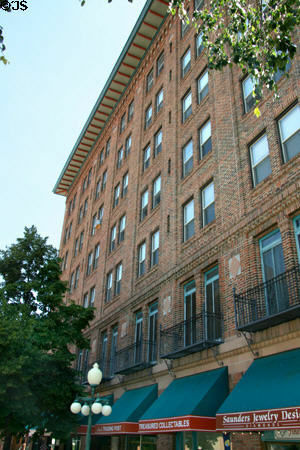 The Placer Hotel is a modern reinforced-concrete building featuring the flat-slab construction used earlier in the Allen Building in Saint Paul (1906-1907, 1910). With 173 rooms, it was the largest hotel between Minneapolis/Saint Paul and the West Coast. The design combines elements of the Craftsman, English, Italian and Mission styles. The building is representative of Gilbert's western buildings that feature the colorful decorative use of ceramic tile, brick, wrought iron, and stucco. The title page of the drawings for the building indicates that George H. Carsley was the architect and Gilbert, the consulting architect. [Drawings for the Placer Hotel are at the Montana Historical Society. http://nwda-db.wsulibs.wsu.edu/findaid/ark:/80444/xv53015] In Gilbert's letters, he states that he was designing a hotel in that year. With the Woolworth project under way, it is surprising that Gilbert found time to participate in work in Montana. It is likely that Gilbert's participation in this project was intended to help Carsley launch his independent practice in Helena. 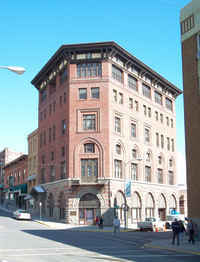 Today, the Placer Hotel is one of the prominent buildings in downtown Helena, along with the Gilbert-designed Montana Club (1903-1905) and the U.S. Federal Building (1904), designed by Supervising Architect of the Treasury under the direction of Gilbert's former partner, James Knox Taylor. A railroad station (outside of downtown) designed by Reed & Stem completes the handful of notable commercial and public buildings designed by Saint Paul architects in Montana's capital city.